13, 66, 79, 160, 23. These are so much more than random numbers. We have worked tirelessly over the past week and today was no different. Our last full day in Falfurrias began bright and early for two reasons. First, we wanted to try and beat the triple digit Texas heat, but we were also so anxious to get started as we knew this would be our last chance to get as much done as we possibly could. 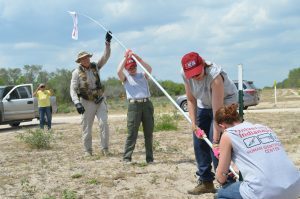 The team was incredibly efficient with our line searches this morning and covered approximately 5 miles of the ranch with the assistance of Don, Eddie, and a third volunteer. After a quick lunch break we serviced 34 water stations by splitting the route between two groups. 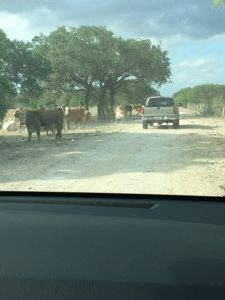 Haley and myself traveled with Eddie and were lucky enough to come across a rancher who was so kind and supportive of the work conducted by the South Texas Human Rights Center (STHRC), and it really speaks to the character of the people of Falfurrias. 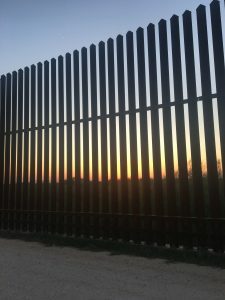 For the evening we headed to McAllen to meet up with Sister Pam who has assisted previous field seasons but whom I had never met (all the wonderful things I had heard about her are absolutely true). 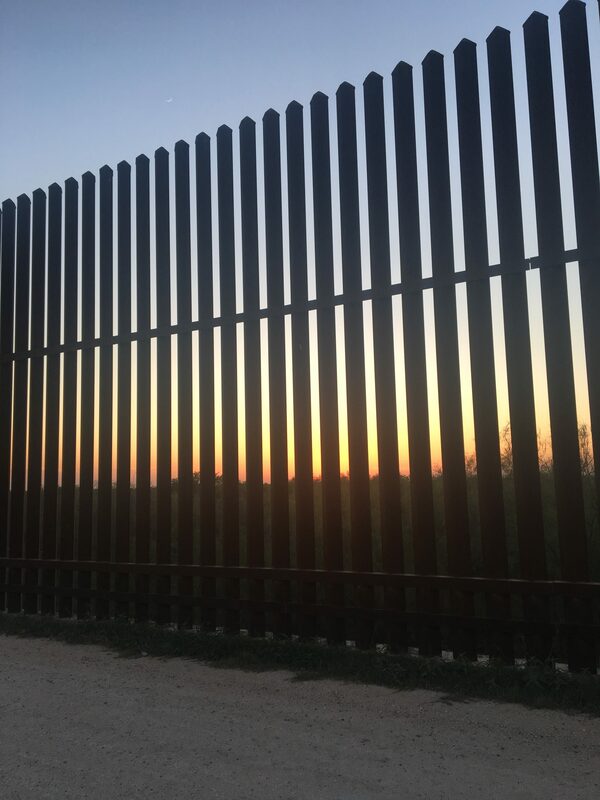 We visited the border wall before going to Palenque Grill for dinner and live mariachi music. It was the perfect way to end our evening. Our time in Texas has come to an end and I am so proud of all we were able to accomplish here. Our mission was to provide humanitarian aid to those who desperately need it, including both the living and the dead. Without the support of the ranch owners, the expertise of Deputy Don, the endless work Eddie performs on a daily basis, and encouragement from people like Sister Pam, our team would not have been successful. We are so humbled and extremely grateful to have such hardworking and generous people to work along side. There is so much work that still needs to be done. It can be overwhelming when we’re standing on an acre of land among thousands that still need to be searched, but with every inch of land covered, and with every water station built and filled we are making progress. 13, 66, 79, 160, 23: five numbers that mean so much. We installed 13 new water stations. We serviced 66 additional stations resulting in a total of 79 water stations that were filled with 160 gallons of water. 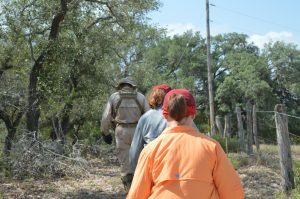 We covered approximately 23 miles of rough terrain under the Texas sun by foot. For us these numbers represent lives saved by available drinking water, these are areas of land that have been narrowed down for future searches, recoveries and identifications that can bring families closure on missing loved ones. These numbers are proof that every small action can have a big impact. Thank you Texas, you have forever changed me and I hope to continue this humanitarian work in the future. Until next time! What a day! Today our group of five split into two groups, each with different goals. 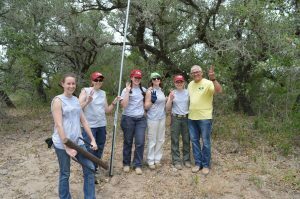 I went with Dr. Latham, Angela, and Deputy Don to begin searching a 1,500 acre area of a Ranch, while Erica and Rachel went with Eddie to repair the first water stations that were placed on the Ranch in 2013. 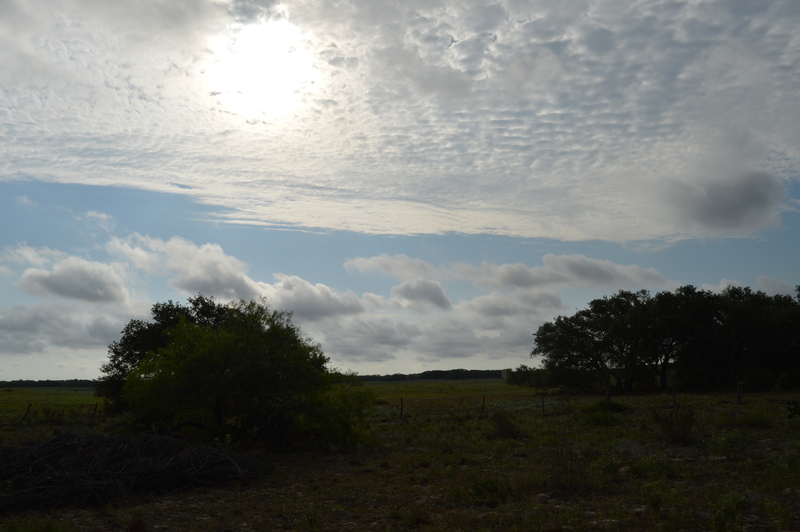 The South Texas environment is very unforgiving. It is extremely harsh. This morning at 7am, it was 77 degrees Fahrenheit but 92% humidity making it feel much warmer than it was. We started conducting line searches in one pasture of the Ranch at about 8am. 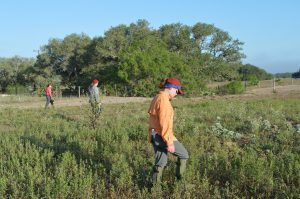 The goal of a line search is to spread evenly apart and search a relatively large area of land for bones. All of the areas we were to search today were quite heavily wooded, and thus it was extremely difficult to stay in a straight line. We made several passes across the pasture and found various animal bones. After feeling like we had covered the first area, we moved on to the second across the street. This area was more heavily wooded than the first. Again, we spread evenly apart and attempted to conduct a line search. Our efforts to stay in a straight line were futile, however, due to the large amount of trees in the pasture. At one point I actually found myself lost in the brush. I couldn’t tell which way was out from the brush I was under and I couldn’t spot any of my team members nearby. I couldn’t hear them talking either. I saw a path, which is frequented by migrants, and began following it. I quickly found myself on the road several meters away from my teammates. While I was in absolutely no danger because I had water and teammates who care about me nearby, I felt a slight panic in the pit of my stomach. I cannot imagine making the journey that a migrant makes. When you are standing in the middle of the Texas brushlands with the sun relentlessly beating down on you, it is extremely difficult to imagine making a long journey without any sense of direction, let alone such a journey without any food, water, and the fear of being seen. Dr. Latham, Angela, Don, and I walked for about an hour and a half before we had to take a break because we felt like we were going to pass out. We drank bottles and bottles of water and Gatorade and we were still extremely uncomfortable and totally exhausted by the end of the day. This experience in South Texas thus far has been extremely eye opening and wonderful, but at the same time heartbreaking. Every step we take on the Ranch, we wonder if someone could be near us hiding, dying, or deceased. We wonder if our attempts will be successful or not. And I am constantly thinking about my future. I admire Dr. Latham for many reasons and one of those reasons is her tenacity. She doesn’t give up when it is 120 degrees and 99% humidity. She doesn’t give up when we don’t find anything on our first try. And most of all, she doesn’t give up hope; hope that we are helping in this migrant crisis both at an individual level, and a crisis level. 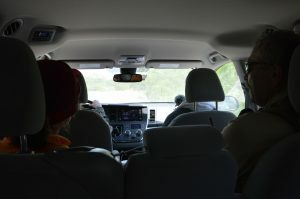 When I traveled to South Texas last May with Dr. Latham, I learned so much about the dead. I enjoyed my time a great deal. This May, however, I have learned so much about the living. It is one thing to talk about a crisis, and an entirely different thing to walk through it. Tomorrow we will continue our searches on the Ranch with renewed hope and excitement and recharged batteries! Another day in Falfurrias has passed us by and what a productive one it’s been! We started at the human rights center this morning to meet up with Eddie and discuss the day’s activities. 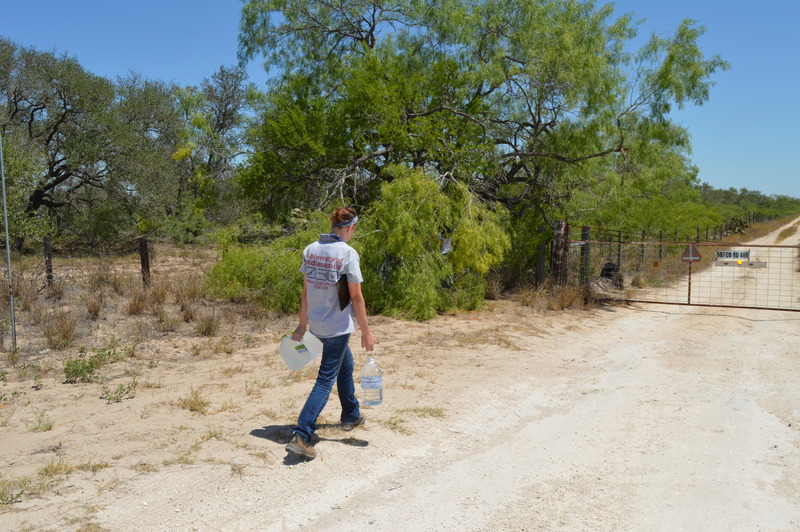 Today was the day we would be going on to the Ranch to build all of the water stations that we fundraised for. We packed up all of the supplies we needed, headed out to the ranch, and was first met with a lot of cows! We saw them throughout the day everywhere we went, and while they were curious they kept their distance. We then began building our first water station from scratch. It was slow going at first, but with each station we became more proficient and became comfortable with our individual roles during the process. 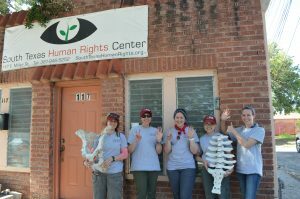 After about six water stations we headed back to the human rights center to eat lunch and gather more supplies. 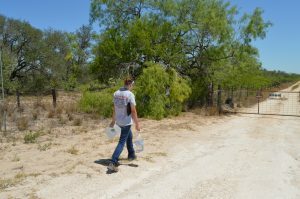 We wasted no time getting back on the ranch and right back to work, timing how fast we could build a water station as if we were part of a pit crew in our own version of the Indy 500. 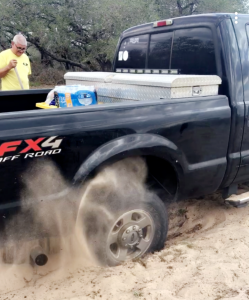 The second half of the day brought us to a section of the ranch that was too sandy for our vehicle, so Rachel and myself traveled with Eddie and Don in their trucks to put up a water station there while the rest of the crew searched another area. Setting up the water station went well but when we tried to leave Don’s truck got stuck in the loose sand! It took a bit of team work, some digging, a lot of sticks, and a tow strap but we were finally able to move out of the sand and back to the rest of our team. We then all loaded up in the trucks and drove to a less sandy area to set up our final water station. By the end of the day, we surpassed our goal of setting up ten water stations reaching a total of thirteen! 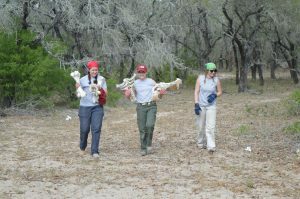 We were also so excited to leave the Ranch with our arms full of bones from cow skeletons we found throughout the day. 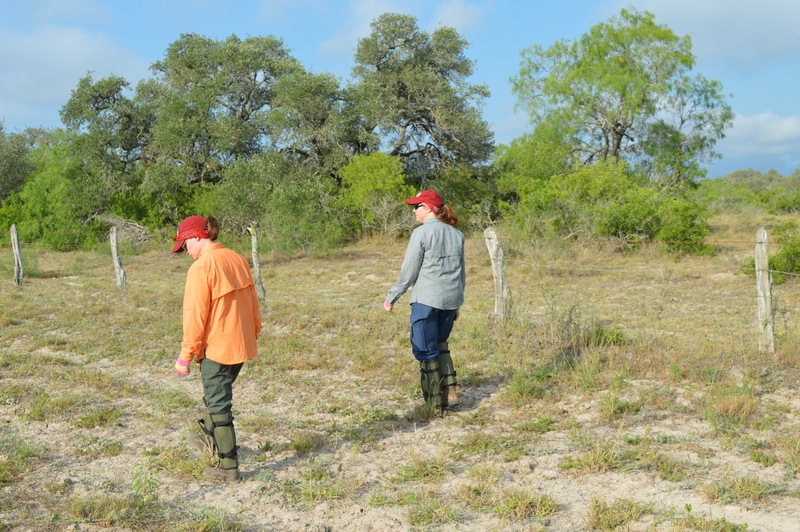 Today we were able to experience a little bit of everything: we built water stations in the ever-present Texas heat, searched through sections of sandy soil, dealt with spiders, bees, chiggers, and ticks, and we saw, identified and collected quite a few (cow) bones. We are so proud of all we were able to achieve, but the reason for our work here has not been lost on us. The water stations we built today may save lives. The searches we conduct may help bring loved ones back to their families. Did we put in a lot of work today? Absolutely, but our work here is not finished. We’ve reached one goal but we’re only just getting started.